Just recently I was sent a Rove 7-Piece Laptop Iced Bento Lunch Box and I love it! It comes with a molded ice pack that attaches to the lid along with a fork & spoon, a removable bento insert and the top of the lid has a handle for easy carrying. It all closes up nice and secure (which means if kids are using it they may need a little help getting it open) so nothing spills out if you use the inside bento lid. 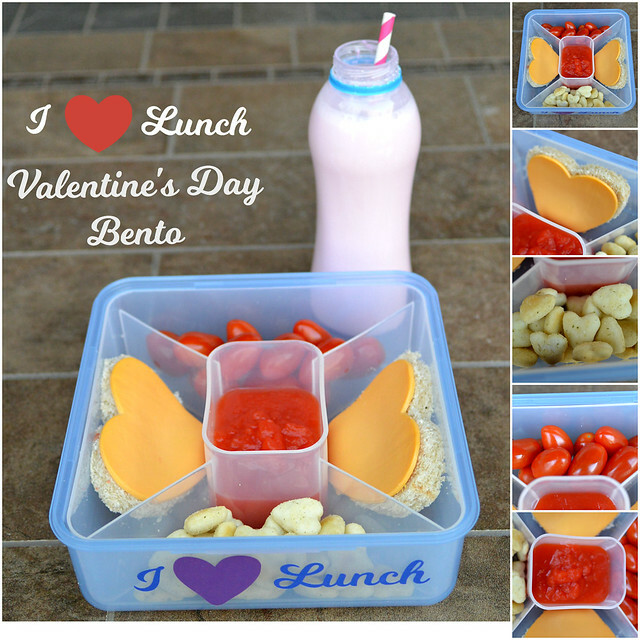 I thought it would be fun to make a Valentine’s Day themed lunch and share it in the post. I even took some vinyl and cut out an “I ♥︎ Lunch” phrase to put on the Rove Bento Box, and I love it…and I love lunch! You may have noticed it’s been a little quiet here on the blog this last week. That’s because it’s been the last week we’ve had our daughter home before we have to send her back to college after Christmas break. I wanted to soak up as much time as we could together, because as much as I appreciate being able to communicate with her thanks to our Walmart Family Mobile Lowest Priced Unlimited Plans, there is nothing like talking face to face and getting a big hug from her. I honestly thought that when we dropped our daughter off at college in August that we would see her frequently on weekends. Boy was I wrong. She’s taken to college like a fish to water and has only been home once in the last six weeks. I’m actually really glad about that but it means that I didn’t send her with nearly enough cleaning supplies than she needs. I decided to visit her this past weekend and make my delivery a little fun and Halloween themed by putting together a “Trick or Treat” box filled with A Plus Values for a (hopefully) A Plus Student! I’m all about making things personalized and MINE. Whether that’s through having my name embroidered on a tote bag or putting my favorite cartoon character on a phone case, I want my things to be unique and reflect my personality. Kidecals are delightfully versatile, crazy durable labels and stickers. While traditionally we think of putting labels on things for school, they really can be used for all kinds of things.